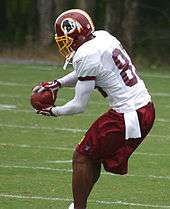 Santana Moss is the recordholder for single-season receiving yards. The List of Washington Redskins football receiving leaders includes single-season and career records for each of three statistics: yardage, number of receptions, and receiving touchdowns, as well as single-game records for receptions and receiving yards. The Redskins compete in the East Division of the National Football Conference. The franchise was founded as the Boston Braves, named after the local baseball franchise. The team changed their name to the Redskins in 1933 and moved to Washington, D.C. in 1937. The Redskins have played over one thousand games. In those games, the club won five professional American football championships including two NFL Championships and three Super Bowls. The franchise captured ten NFL divisional titles and six NFL conference championships. The Redskins won the 1937 and 1942 Championship games, as well as Super Bowl XVII, XXII and XXVI. They also played in and lost the 1936, 1940, 1943 and 1945 Championship games, as well as Super Bowl VII and XVIII. They have made 22 postseason appearances, and have an overall postseason record of 23 wins and 17 losses. Only five teams have appeared in more Super Bowls than the Redskins: the Pittsburgh Steelers (eight), Dallas Cowboys (eight), Denver Broncos (eight), New England Patriots (eight) and San Francisco 49ers (six); the Redskins' five appearances are tied with the Oakland Raiders and Miami Dolphins. ↑ "History: History by Decades". Washington Redskins' Official Website. Archived from the original on 2007-10-29. Retrieved 2007-12-11. ↑ "Washington Redskins (1937–present)". Sportsecyclopedia. Retrieved 2007-12-11. ↑ "Washington Redskins History". CBS Sportsline. Retrieved 2008-08-24.